While earning less than £15,000 per year from her work in a budget supermarket, single mother Cecilia Apau has bought a desktop computer, a laptop, two tablets and two smartphones for her three children over the past four years, for use alongside their flat screen TV with a cable box. Over the past year, we have interviewed Cecilia, Robert, Dani and many more parents as part of our MacArthur Foundation-funded project, Preparing for a Digital Future. Among our many fascinating findings, we’ve been struck by the contradiction between a generation of parents that, in one way or another, is energetically embracing digital media in their homes and yet, often from the moment they open the door for our interview, assail us with anxieties and doubts about what digital media really offer. Indeed, as parents fill their homes with new devices of many kinds, the mass media shout out panicky headlines that fuel their anxieties to the point where living up to the rules become more worrying than screen time itself. These warn of the dangers (e.g. Children risk becoming CROSS-EYED if they over-use smartphones and hold devices too close to their face and Screentime Is Making Kids Moody, Crazy and Lazy). They chastise parents their own media use (e.g. How to Cut Children’s Screen Time? Say No to Yourself First) and for how they use devices as babysitters (e.g. Worrying rise of the iPad childminder) and threaten future retribution from children once grown up (e.g. Children could SUE their parents in future for a breach of privacy if they upload photographs of them on to Facebook). Meanwhile the experts advocate no more than one or two hours of combined “screen time” per day, warning of harm to grades and health. Yet debate over time restrictions continues, not least because this is a limit that few parents today would consider remotely realistic - although Steve Jobs claims to have managed it, David Cameron confesses he struggles, and Mumsnet offers practical tips. So why are parents going against this barrage of advice to buy more devices? While many have taken on the view that “good” parenting is “media-free” parenting, their actions bely their words. So can we imagine some more constructive advice for a new, tech-engaged generation of parents that want and often have the ability to support and enable rather than just restrict and police their children’s media use? Limiting screen time isn’t really the advice that working single-mother Cecilia needs, as she values the tablets for helping her kids with “maths, spelling, reading, anything… I want them to learn every day, to improve their reading.” But she doesn’t really know if it’s working, can’t trouble-shoot when things go wrong and doesn’t know where to turn to for advice when her children’s teachers offer little beyond basic e-safety messages. Emphasising limits isn’t so helpful to Robert either, since he’s trying to channel Jake’s interest in technology into learning to code and develop apps to open up a possible career path for him, and appreciates that gaming gives Jake and his younger brother a shared interest. As for Dani, she’s already engaging in sophisticated conversations with her boys about how screen time offers such benefits as connecting with others and improving skills by playing games like Minecraft – as well as discussing when they need to shut down and go outside. She’s hardly the ‘digital immigrant’ the well-meaning advice-givers assume her to be. Parents who heavily restrict their children’s access to the internet tend to have children who experience reduced exposure to risk, but also fewer opportunities for learning and engagement. There is little evidence that use of technical restrictions, on their own, is effective in reducing children’s risk of harm online, possibly because children find ways around the restrictions, or because the software can be clumsy, leading families to turn it off. Insofar as parental restrictions mean that children use digital media less, and less deeply, children may not get the chance to explore the media’s possibilities or to develop the skills needed to benefit. Active mediation is associated with increased positive outcomes, but does not reduce exposure to risk on its own. 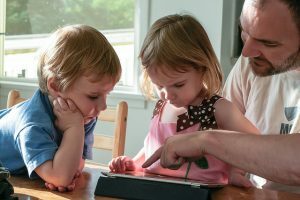 Although many parents use digital media as a way of keeping children busy, when parents jointly engage with media, their children enjoy and learn more. In producing advice and resources for parents, government and NGOs should acknowledge the diversity of families, rather than assuming equal or consistent access to digital and other resources and opportunities. They should curate and promote recommendations for high-quality content, differentiated by age, interest and special need. Parents need concrete suggestions for how to use their digital expertise to engage with their children, not only to police them – and they need not feel pressure to ‘keep up’ with others since there are as many approaches to digital media as there are families. And while they’d like an easy and obvious location or portal for finding such suggestions, that doesn’t mean all their needs are the same or that a single, simple set of resources will do. Parents can help their children by not being intimidated by new technologies, as well as modelling constructive and balanced digital habits themselves. Their experiences, values and expertise - digital and non-digital – are a resource for their children. Parents should understand that taking a restrictive approach may avoid risks in the short term, but doing so is likely to limit children’s opportunities. It is generally preferable to try instead to build children’s resilience so risk does not become harm. Government and industry should find ways to make highly inappropriate content and related risks inaccessible to children, for if parents didn’t have to worry about the worst excesses of the internet, their judgments could be more nuanced. Content commissioners, funders and producers should develop good practice in evaluating what is valuable, especially what is ‘educational’ or otherwise beneficial about their products, avoiding labelling content as ‘educational’ simply as a marketing tool. This should be made transparent to parents. Industry should ensure it is informed by up-to-date research, and that it complies with codes of conduct and regulation designed to protect children’s rights. All this and more has just been published in our Policy Brief: Families and screen time: current advice and emerging research.